Following the dramatic events of July 2016, the global spotlight has fallen on Turkey’s increasingly authoritarian government, led by President Recep Tayyip Erdogan. International observers fear the attempted coup has given Erdogan, already known for his attacks on press freedom, an excuse to further suppress all opposition. In November 2015, Can Dündar, editor-in-chief of the national Cumhuriyet newspaper, was arrested on charges of espionage, helping a terrorist organisation, trying to topple the government and revealing state secrets. His transgression? Publishing photographic evidence of a highly illegal covert arms shipment by the Turkish secret service to radical Islamist organisations fighting government forces in Syria – a crime that was in the government’s interest to conceal, and a journalist’s duty to expose. Arraigned by the President himself, who called for Dündar to receive two life sentences, he was held in solitary confinement in Turkey’s Silivri Prison for three months while awaiting trial. 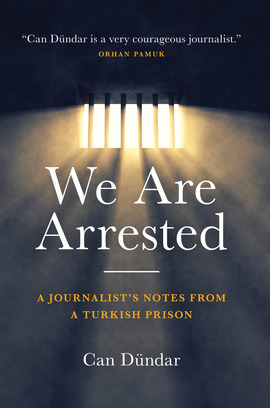 We Are Arrested is Dündar’s enthralling account of the newspaper’s decision to publish and the events that unfolded as a result – including would-be suicide bombings, assassination attempts and fierce attacks from pro-government media – as well as the time he served behind bars for defending the public’s right to know.